In order to meet special requirements of our customers, SIGMA hot mix storage silos can be manufactured in various capacities and concepts, thanks to our modular structure. 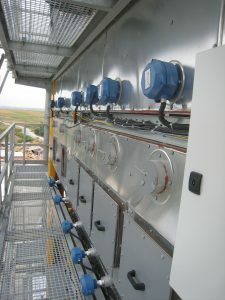 Standard SIGMA hot mix silos have one or two compartments. Outer surface of the silos are insulated with rock wool and covered with aluminum sheets. In two compartment product silos, two different types of asphalt can be stored at the same time. As the silos are modular in structure, higher capacities can be achieved by adding extra modules or by placing additional silos in front, rear or sides.